Meat has been a long sought after source of nutrients in human diets. Its nutrient-dense composition of protein, fats, vitamins and minerals makes it an integral part to healthy and balanced diets. As demand for meat continues to increase globally, a better understanding of efficiently producing quality meat products is becoming increasingly important. The Science of Meat Quality provides comprehensive coverage of meat quality from the biological basis of muscle development to end-product-use topics such as preparation and sensory analysis. 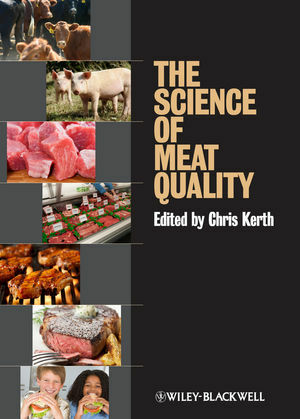 The Science of Meat Quality explores the basis of meat quality long before it hits grocery store shelves. The book opens with a look at cellular muscle tissue development, metabolism and physiology. Subsequent chapters look at topics surrounding the development of tenderness, water-holding capacity, lipid oxidation and color in meat products. The final chapters discuss producing a good-tasting end product from preparing meat to preventing food-borne illness. Each chapter contains not only the theory behind that topic, but also detailed lab methodologies for measuring each meat quality trait. The Science of Meat Quality is an essential resource and reference for animal scientists, meat scientists, food scientists, and food industry personnel. Chris R. Kerth is Associate Professor of Meat Science and Muscle Biology in the Department of Animal Science at Texas A&M University, USA. A color plate section is located between pages 192 and 193.